Instagram is not coming slow and surprising everyone with its wonderful features. Now, it will be easier for you to follow people you have just met. Instagram is introducing a new feature, in which your username will be visible on your phone in a way that your friend will be able to scan it to follow you. Named as Nametag, this tag will be customizable with additional stickers, designs, and colors. 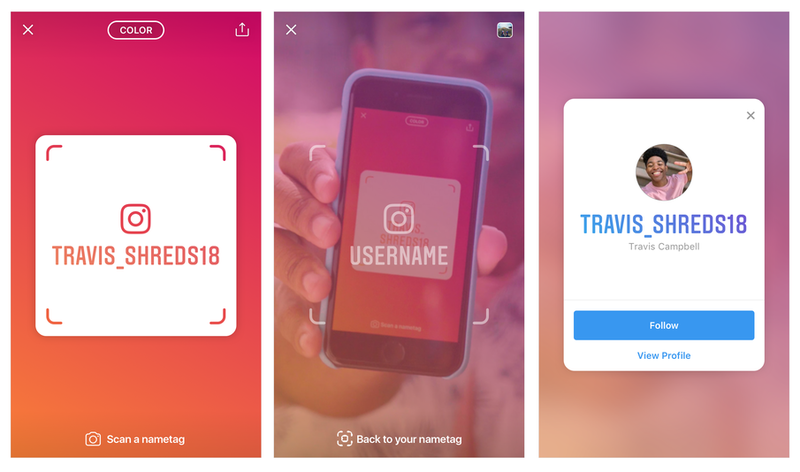 "Nametag is a customizable identification card that allows people to find your Instagram profile when it’s scanned. Your nametag is uniquely yours and makes it quick and fun to add people and accounts you discover in person," the company wrote in a press release while introducing the latest changes. Twitter, SnapChat, and Facebook already have the same feature where users can generate their personalized QR codes that help others to find you quickly. In your profile, tap on the menu button. Select "Nametag", it will display your personalized code. To scan others' QR codes, you can focus on their tag through your mobile camera. "Nametag" is now available worldwide for the major operating systems, i.e, Android and iOS. Instagram is about to release another feature that is in testing mode at some US universities currently. You will be able to add your school, class year, and society memberships. This feature will make it easier for you to find your classmates if they have added themselves.